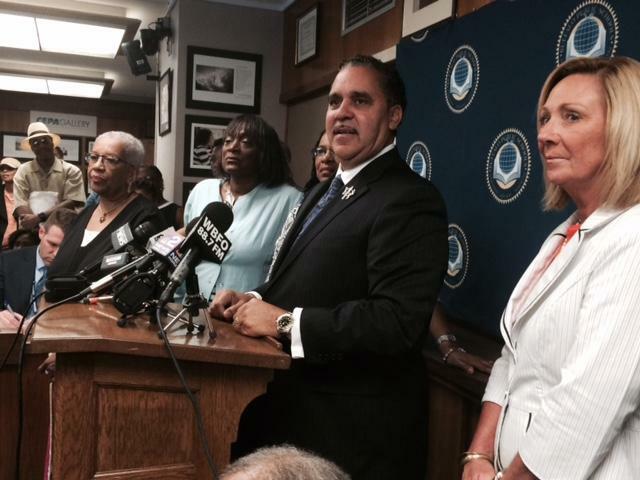 The Buffalo Public School District has a new leader. WBFO's Focus on Education Reporter Eileen Buckley says without debate, city school board members voted unanimously to hire Dr. Kriner Cash as new schools superintendent. WBFO's Eileen Buckley reports on the selection of Cash and has reaction from board members and the leader of a parent organization. 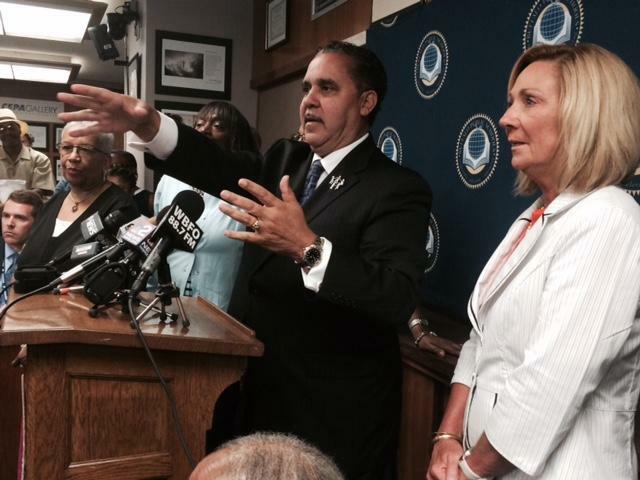 It's rare to hear the Buffalo School Board agree, but it happened at Tuesday special session. The board said the former Memphis City School leader has the right skills to make big improvements for school children. Dr. Kriner Cash holds news conference after being selected by school board. "He is the right candidate at the right time for this community. He has a passion for urban education. He has a passion for kids," said School Board President James Sampson. Cash's contract is pending as the district awaits certification approval from the state Education Department. But that's considered a formality. Cash appeared at a news conference with board members immediately after their vote at City Hall. "The Buffalo city schools will be under construction. We have to do it, and I got to tell you, remember this, whenever you are in a construction zone -- make sure you've got on your hard hat," said Cash. Cash said he will be evaluating staff and looking at staff capacity. The schools are the most important unit in the system will make sure all schools have 'good principals. Dr. Kriner Cash addresses the media during a City Hall news briefing. 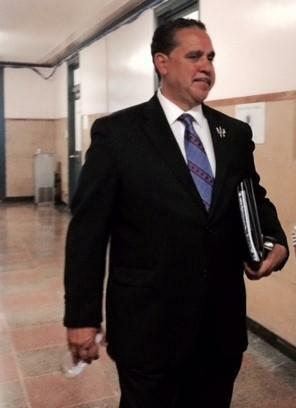 "I'm going to make sure all schools have a good principal assign to them. That work is going on now. I'm going to take a fresh look at it myself," stated Cash. Majority member Carl Paladino and minority member Mary Ruth Kapsiak did not vote. Paladino is reported to be vacationing in Paris. Kapsiak recently had foot surgery, but she managed to appear for the news conference in a wheelchair. Details of his contract were not released, but some school board members confirmed it is a four-year deal paying Cash $275,000 a year. Cash said he believes they should get a long-run with his work with the school board of about 'three to four years'. Cash told reporters he is not worried about the school board politics. 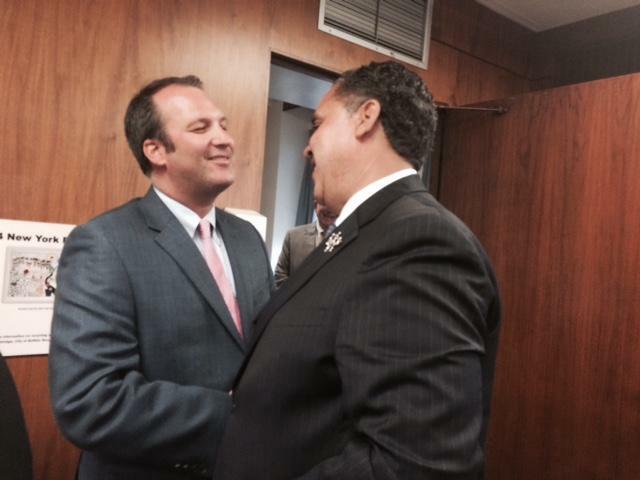 Dr. Kriner Cash is congratulated by Majority Board Member Jay McCarthy. "No worries, no worries -- born positive," responded Cash. "But let me be clear, I've been here ten minutes -- this is Buffalo -- next week it could look like something else. I'm not naive," Cash told reporters. "We want to make sure that we do this right this time," said Sharon Belton-Cottman, Minority School Board member. "We need to make sure that we don't have six superintendents in five years." "From the minute he stepped foot into this town, I realized that he sees what the rest of us are beginning to see and what what we've been yearning for in this town," said Patti Bowers Pierce, Majoirty School Board Member. Parents who attended the special school board session appeared to be pleased with the selection of Cash. Larry Scott is co-chair of the Buffalo Parent Teacher Organization. However, Scott indicated they had some early concerns. "I think some of the reservation have to do with some of the funding he has received through the Gate's Foundation and how he used that to promote certain reforms, also having the commissioner recommend him to be appointed superintendent to the board, I also think that made us very skeptical," stated Scott. Cash refused one-on-one reporter interviews, but will hold a 'media tour' in September. It appears the former Memphis City School superintendent is the top candidate among the Buffalo School Board. WBFO'S Focus on Education reporter Eileen Buckley says the board interviewed Kriner Cash emerging with favorable remarks. The Buffalo community had a chance to meet the front runner for the schools superintendent position. Candidate Dr. Kriner Cash told a crowd in Performing Arts Thursday night he can turn the city's schools into much better facilities because he has already done it in a much larger system. The Buffalo School District held a public forum Thursday evening for the community to meet the top schools superintendent candidate Dr. Kriner Cash. WBFO's Eileen Buckley co-moderated the event with WGRZ Reporter Claudine Ewing. You can listen to the entire event.